Hey everyone, I’m Josh and, thanks for joining me for this week’s Monday Money. Generally, in this column, we talk about things like budgeting, investing, etc… However, today I was inspired to write about something else, the financial burden and consequences associated with an operating while intoxicated conviction. The reason I decided to write about this is one of my friends was caught driving along the road while under the influence. I might add that his friends being myself and many more were with him that night and offered to drive him home. Unfortunately he declined all offers. Now, he’s got a lot of complaints about the cost of his decision! First off, I want to let you all know that this is no plea to reduce the cost of an OWI, DUI, or DWI charge. By nature, these charges stem from reckless actions that could cause danger to the operator as well as innocent consumers around him or her. That being said, this is more of a way for me to say, “Hey, don’t do that!” and explain why from a financial standpoint. Originally, I attempted to get in touch with my buddy’s attorney for an interview. I figured, who would be better to explain the cost of a conviction like this than someone who works in the field? Unfortunately, his attorney declined to comment. No worries, I was able to contact another attorney that was willing to chat. His name is John Dobogai and he is an OWI attorney who practices in Wisconsin. Here’s what I learned while I spoke with him. “So, what’s the average flat fee a legal attorney will charge?” you ask. Attorney Dobogai said that when it comes to OWI, DUI, and DWI charges, “Most attorneys will charge a flat fee that ranges between $500 and $10,000” for the defense. He also added that “Some lawyers charge an hourly rate instead.” He explained that on some cases that take too long, flat fees would leave the attorney underpaid for the work that needs to be done. In some cases that are open and shut, and don’t take much time, consumers can find themselves overpaying for the defense in the case of a flat fee. He also added that the “average cost is around $1,000.00”. Now we know what fees attorneys will charge for defense in these cases, what about penalties associated with a conviction? So of course, I asked that question. In his response, attorney Dobogai stated that we would need to discuss only first offences today. This is because we would have been on the phone for hours discussing what happens on recurring offences. None the less, he stated that a first time offender in his state, Wisconsin “Would pay a forfeiture of somewhere between $600 and $900.” He went on to explain that when we think of penalties associated with crimes, we call them fines. However, because in his state, OWI isn’t necessarily a crime, the word fine is replaced with the word forfeiture which means about the same thing. At this point, I was thinking, “Well, why is my buddy complaining so much that’s not a lot of money!” Then attorney Dobogai went on to explain more penalties. After the fine, those convicted will need to take part in a “mandatory alcohol assessment and driver safety plan”. Attorney Dobogai explained that “The assessment costs between $200 and $260”. He stated that “The driver safety plan costs a couple hundred dollars if they go to technical college”. The driver safety plan classes usually consist of 5, 3 hour sessions. He said that if those convicted of OWI decide not to go to a technical college for the classes, “they can go to individual counseling and the cost on that depends on the agreement with their insurance [provider]”. I figured, this had to be about it, but was wrong again. Mr. Dobogai went on to explain that those who are convicted “will also have to pay a $50 application fee for an occupational driver’s licence as well as a $200 application fee to reinstate their licence” once the suspension has expired. Finally, those who are convicted will also need “to get SR-22 insurance for the term of the occupational licence.” SR-22 insurance is a form of high risk insurance that is required by law to be carried by drivers with history of reckless driving activity. This insurance can often times be double what consumers are already paying and more. We all know that drinking and driving is a bad idea. It’s a dumb mistake that could cause you to commit a criminal offence. Drunk driving could kill the driver or worse, kill innocent people around them! That in and of itself is enough to make most drivers think twice before drinking and driving. However, if that’s not enough for you, think of the $4,280.00 average price tag associated with such actions. That’s a huge financial burden that can cost you years of your savings! Have you ever considered driving after a few drinks? Would you have even considered it if you knew the total cost of getting caught? Please provide your answer in the comments below! 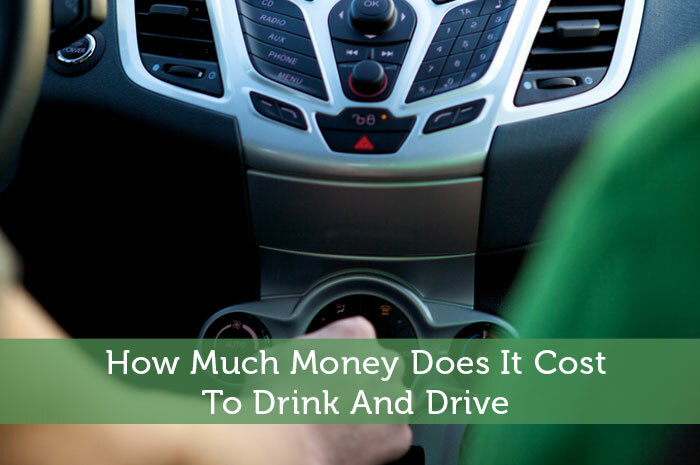 Special Thanks: I really want to give a special thanks to attorney John Dobogai for spending the time with me on this article about the cost to drink and drive. We talked for a good amount of time. If he was paid for that time, I’d be broke. It was hard to find an attorney that was willing to sit with me and answer these questions in detail. So hard in fact that I thought I was going to have to change the topic for this week. But, attorney Dobogai came to the rescue! That being said, thanks John, I really appreciate it! I would never consider drinking and driving and never have. One of my coworkers is in jail right now as he had a second offense. So the cost could be a LOT greater if you repeat your mistake. He is lucky they are taking him back so he will be employed after this short stint, but he is losing money while being away, and losing time with his son. He had no car to get to work previously and had to take a taxi or get a ride with someone else. It adds up! Regardless of actual costs, I think the emotional and mental costs are sometimes greater. Hey EM, thanks for swinging by! Drinking and driving is definitely a costly mistake, but I didn’t add emotional factors in. Thanks for adding that here in the comments. I’ll see ya around! Everyone knows the consequences of driving under the influence of alcohol. In my present country, once you are caught driving intoxicated with alcohol, you are automatically sent to jail without due process. After few months you will be deported. The bad news, you cannot withdraw your money in the bank. You cannot also get or collect your personal stuffs or documents in your apartment. Hey My Wealth Desire, thanks for swinging by? Although I would agree that in your country, the punishment is much more harsh than in mine, I have to wonder what the rates of drunk drivers are there? I’m sure that as punishments become more severe, more and more people avoid the action that leads to the punishment. Thanks again! Those are extreme consequences but drinking and driving is something that people do need to take seriously. I remember as a child an accident involving a motorcyclist and a drunk driver, and it was roughly 7 or 8 am on a workday! I may not agree with the consequences in your country, I do agree they need to be tough. Thanks for sharing. It’s really important for people to know the repercussions of a DUI, especially for the younger ones who are more reckless. Hey The College Investor, my pleasure and thank you for your comment! I don’t drink and wouldn’t think twice about riding in a car with someone who was. My niece’s father went to jail for 10 years for killing someone (happened to be a friend’s uncle) while drunk driving. My brother crashed and totaled my first car and is now in jail after his third DUI. Hey Kasey, thanks for sharing such personal reasons for you to not want to drink and drive. I’ve got a friend who is serving 8 years for killing someone while drinking and driving. Not to mention, in high school, I lost 3 friends in a crash that killed 4 fueled by drunk driving. So, I think I know how you feel about the topic. Again, thanks for sharing! I would not drink and drive. I already have friends whose lives have been completely changed by it. Right now I have a friend who is serving a 1 year sentence. I won’t get into the exact numbers but he had to pay court fees, attorney fees, hospital bill since he crashed and woke up in the hospital, hefty fines since it is his third offence, and also lost his job at a hospital which he will never get again. His life will never be the same. Hey Demaish, thanks for joining the discussion! I’m sorry to hear about your friend. Unfortunately however, I do have to disagree with his actions and hold back any sympathy I would have had for him if this was his first offense. After the first one, he should have gotten the hint. After the second, well, in my humble opinion, he needs to hit rock bottom to realize there is something wrong with his actions! Very enlightening facts! Thanks for doing all the research into this. I’ve always been good about knowing when to stop so that I can drive home safely. I’m also an extreme lightweight so I know my drink limit is 1-2. I live in LA though and its pretty crazy on the weekends. Every weekend that I’m out driving later at night I most likely will see a drunk driver here. You have to basically drive everywhere to get anywhere here. It leads to a lot of drunk driving unfortunately. Hey Christine, LA huh? I bet it does get pretty crazy there! Also, I’m happy to have researched this. I actually had a great time speaking with attorney Dobogai and compiling the facts. I’m glad you enjoyed my work on this topic and hope to see you around here more! Thanks for swinging by! Although not *quite* the same, I drove while on medication that specifically said “do not drive while taking this medication” and it was a bad idea. Thankfully I didn’t crash, or get pulled over or anything, but it was a scary, eye-opening experience. I imagine the effects of the medication were very similar to what driving drunk would be like. Never again! Not worth the risk!! Hey Amanda, I’m glad your drive ended in a safe way. Prescription medication can be just as bad if not worse than alcohol when behind the wheel, that’s for sure! As a matter of fact, I suspect that to be the reason several states are changing their laws from DWI or driving while intoxicated to OWI, operating while under the influence of a mind altering substance (Including alcohol, prescription drugs, or any other substance that impairs our ability to drive). Thanks for stopping by! The cost of ruining your life or someone else’s is too high for me. I have better things to do than to drink and drive. Hey Grayson, I’ve been following you over at Debt Roundup for quite some time now, and I’ve gotta say, that’s what I expected your answer to be! I couldn’t imagine that a guy as smart as you would stoop to poor decisions like this! Thanks for swinging by! One of the cab companies runs an add that lists all the costs of a DUI, and the tagline is “Wouldn’t calling a cab be cheaper?” I think that’s a great ad! I’m glad the fees are high. Maybe it might make someone think before driving drunk. What is the price if you hurt or kill someone? Nice write up Josh! Unfortunately people getting behind the wheel in this condition are not thinking about the consequences, financial or otherwise. As you alluded to, the costs could be much greater than $4,280. The costs may be even higher than you estimated … what about all the missed time from work while the offender sits in jail and then has to attend all the court dates, meetings with the attorney, and mandatory classes? Great post … I hope it helps to prevent a few cases of drinking and driving! A friend of mine’s brother got caught drinking and driving and it cost him a LOT of money. Not to mention he was humiliated. It’s better of course to just not drink and drive at all. LOVE this, Josh. DWI causes so much pain and heartache to so many people. My little bro, who is normally extremely responsible, was driving while intoxicated years ago (he was just barely over the legal limit – it really doesn’t take much to impair your judgment), and forked out about ten grand between costs, raised car insurance rates, etc. He also almost lost an opportunity to become a volunteer firefighter because of the DWI too. The chief wanted no part in hiring someone so irresponsible, but luckily he saw that it was out of character for my brother and gave him a chance anyway. Seven years later, he’s still fighting fires and helping people, but that almost didn’t happen because of his stupid choice earlier in life. I NEVER got behind the wheel while under influence. This means that, if I take a sip of wine or beer (I don’t drink ‘heavy stuff’, I don’t drive. The laws are strict when it comes to this and they should be even tougher. There is a website called onedui.com that gives a range of costs for a first time DUI in each of the 50 states. It says that the average cost in Wisconsin is from $7,247 to $9,647. It appears that the most expensive state is Massachusetts. The average cost is from $11,609 to $14,009. As you mentioned, never drink and drive, not only due to the cost of a DUI, but to the increased chance of injuring or killing someone. I think the scariest thing is you can still be charged with a DUI even if you are under the .08 limit. It really makes it vital that you don’t drive after drinking unless you give yourself plenty of time to sober up. Wow – one more reason not to even come close to taking that gamble. I know someone who’s teenage daughter was hit and killed by a drunk driver while she was riding her bike home from work. The driver got 3 years in jail for that and he spent tens of thousands of dollars on a defense. It simply isn’t worth all the damage that one can do to take the risk! Fantastic interview… In my profession as a Tax preparer I see the results of these issues. This article only covers the tangible costs to this problem. There are extended problems including family arguments and stress because of budget shortfalls and actual time (man hours) to rectify the problems by missing work or missing quality time with the family. The “morning after” health issues can be costly in more ways than one. If they offered to pay me to drive drunk I wouldn’t even consider it. It’s not worth it an any price!